Just when schools are trying to cut funding for the arts, it seems it might be the hottest way for a teen to find herself in a love triangle. 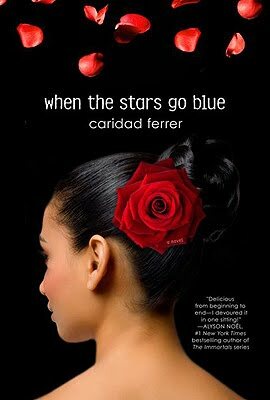 At least that’s the case in GCC Member Caridad Ferrer’s new novel, WHEN THE STARS GO BLUE, out this month through Thomas Dunne Books. A dancer driven to succeed. A musical prodigy attempting to escape his past. And the moment it all goes wrong. Dance is Soledad Reyes’s life. About to graduate from Miami’s Biscayne High School for the Performing Arts, she plans on spending her last summer at home teaching in a dance studio, saving money, and eventually auditioning for dance companies. That is, until fate intervenes in the form of fellow student Jonathan Crandall who has what sounds like an outrageous proposition: Forget teaching. Why not spend the summer performing in the intense environment of the competitive drum and bugle corps? The corps is going to be performing Carmen, and the opportunity to portray the character of the sultry gypsy proves too tempting for Soledad to pass up, as well as the opportunity to spend more time with Jonathan, who intrigues her in a way no boy ever has before. But in an uncanny echo of the story they perform every evening, an unexpected competitor for Soledad’s affections appears: Taz, a member of an all-star Spanish soccer team. One explosive encounter later Soledad finds not only her relationship with Jonathan threatened, but her entire future as a professional dancer. Caridad: Well, given that I was in drum and bugle corps when I was a teenager, where the entire summer consisted of an extended road trip, there was plenty of opportunity for mishap. There was the time when one of our extremely ancient buses broke down literally, in the middle of nowhere. Smoke pouring from the engine, whole nine yards. And it was really hot and humid and utterly gross and we had to wait for our instructors who were in the van to go get help. My other favorite corps tour story had to do with when we were staying at a huge regional junior/senior high school in Kentucky– the area was remote enough that it was the only high school serving a fairly large geographical area, so all four corps competing had to share the facilities (Normally, there were enough area schools where each corps had their own school to stay at). Anyhow, the morning after the show, we were pulling out of the parking lot when the driver’s CB started going and we heard over the speakers, “Does anyone on your bus have one of the bathroom sinks?” No, I’m not kidding. We had to pull over and let the school officials check our buses out, stem to stern and ascertain that we had not, in fact, absconded with one of the bathroom sinks, because one had been ripped from the wall and taken. Stealing a sink? Now that’s original! Caridad: I always knew I was a storyteller, but I had no clue I wanted to be a writer or was meant to be a writer. I always thought I’d be a musician. Actually, I wanted to be Barbra Streisand, but without the diva ‘tude. Music has always been such a huge part of my life and I love the ability that theatre gives you to sink into someone else’s world for a little while. I wanted to be a triple threat—singing, dancing, acting. Unfortunately, a raging case of audition anxiety put an end to that particular dream, but what I found, to my surprise, was that writing allowed me that dream, just in a different manner. I’ve always been a storyteller and writing a story allows me to sink into someone else’s life, into another world, much in the way that performing did. I get to be those people and live their lives, for just a while. So in a why, I did achieve my dream. Just goes to show, you never know exactly how it’s going to happen! Caridad: Absolutely nothing, other than take some formal portraits for my quinceañera at my mother’s behest. And even then, I refused to do the poofy meringue dress. To this day, I still hate those pictures, but for years, my mother had the one I hated the most hanging in her dining room, in a hideously elaborate gold frame, in all its 20×24 glory. When I first brought my (then boyfriend, now husband) to the house for the first time, he made the mistake of admiring that photo. I think he was trying to be nice, although he swears he really loves the portrait. My mother, much to my mortification, said, “Well, when you get married, I’ll give it to you.” WHEN you get married. We’d been dating for less than four months at that point. I wanted the ground to open up beneath my feet and swallow me whole. Despite that inauspicious beginning, we did get married and true to her word, my mother gave us the portrait. Much to my delight, the hideous frame was broken in transit, leaving me to gloat, “Well, now we won’t have to hang it up,” but not such luck. My husband made me pick out a new frame for it, threatening to let my mother choose if I didn’t. So I did, and that damned picture has followed me from house to house, haunting me. My one stipulation is that I make my husband hang it somewhere I don’t have to see it every day. Caridad: I’m a hybrid. I’m a very linear writer– I start at the beginning and go to the end. I’m also a hybrid pantser/plotter, pantsing my way through the first several chapters, then, once I have a decent grasp of the story and characters, I’ll stop and write a chapter-by-chapter outline for the rest of the novel. Q: Where were you when you found out that WHEN THE STARS GO BLUE was going to be published? Tell us the story. Caridad: Which time? Here’s a not-so-secret about this book. It actually sold twice. The first time it sold, I was actually attending the Backspace conference in New York and I was sitting in my hotel with my agent when she received the call. Unfortunately, that publisher didn’t work out, so a few years later, the book went back out on submission. I found out about the second sale while sitting at home. My agent called and told me St. Martin’s wanted it and I may have bounced like a little kid in my chair, because that’s exactly the publisher I wanted it to go to. Thank you, Caridad! Now, everyone go out and buy books, lots and lots of books! And if you’re trying to remember how the aria from Carmen goes, here’s a little taste from the Muppets to remind you.